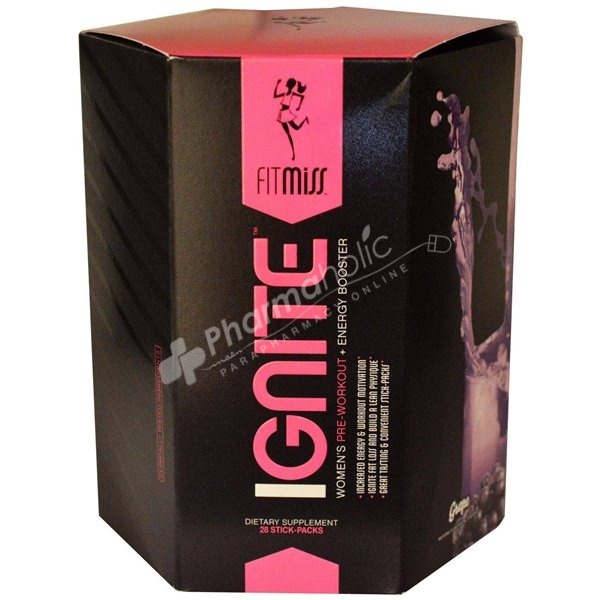 Ignite is a pre-workout energy drink, designed for women, which supports converting fat into energy, imporving endurance, and promoting healthy body composition. SKU: 713757367936 / Product Availability: Yes / Manufacturer: MusclePharm Corp.
IGNITE is designed to support converting fat into energy, improving endurance, & promoting healthy body composition. The L-Carnitine in it boosts your body's ability to burn fat, delays muscle fatigue and acts as a fat metabolizer and energizer. Iginite increses food's thermal effect and changes the way your body metabolizes fat. The Beta- Alanine in it delay the onset of neuromuscular fatigue during sub-maximal cycling and may increase time to exhaustion in women. It also improves your workout & helps build a lean physique. Iginite is designed especially for women. As a dietary supplement, mix stick-pack in 14-16 oz of water, 20-30 minutes before exercise. For best results, drink a minimum of 1 gallon of water daily. Carnosyn Patented Beta Alanine, Choline Bitartrate, L-Tyrosine,L-Glycine, Taurine, L-Carnitine Base, Beet Root Extract (Beta vulgaris) (High in Nitrates), Hawthorn Berry Powder (Crataegus pinnatifida) (Fruit), Agmatine Sulfate, Advantra Z (Citrus Aurantium) (Unripened Fruit Extract), Caffeine Anhydrous,Huperzine A 1% (Huperzia Serrata) . This product is only intended for use by healthy adults over 18 years of age. Do not take this product with any product containing caffeine or other ingredients that have a known stimulant effect. Consult your physician before using this product if you are taking any prescription or over the counter medications or supplements. Do not use this product if you are pregnant, expect to become pregnant or are nursing. Do not use this product if you are at risk or are being treated for any medical condition including, but not limited to: high or low blood pressure; cardiac arrhythmia; stroke; heart, liver, kidney or thyroid disease; seizure disorder; psychiatric disease; diabetes; difficulty urinating due to prostate enlargement or if you are taking a MAO inhibitor. Discontinue use and consult your health care professional if you experience any adverse reaction to this product. Do not exceed recommended serving size or suggested use. Do not use if safety seal is broken or missing. KEEP OUT OF REACH OF CHILDREN. This product was produced in a facility that may also process ingredients containing milk, egg, soybeans, shellfish, fish, tree nuts, and peanuts.